As much as we have written at length about co-working offices, many others have explained it differently for their own purposes. While the name is relatively new, the concept is not. As far back as the late 70’s and early 80’s, the concept of using a business centre without a permanent desk was explored by entrepreneurs and small business owners. The terms Shared Offfice, Cohousing, Hot Desking, Telecentre and others have been used over the years to describe a shared office environment by different business centres and office rental locations. While Wikipedia has its description on the modern interpretation, others will describe coworking as a place where employees of one company work in a collaborative environment to achieve one or many goals while supporting others within their team. Office space providers like Telsec Business Centres will call collaborative work environments for one company “Team Space” because the environment is intended to help team members work together without walls, cubicles or dedicated workstations. Many companies with their own office space have set up teams and put them into coworking environments away from the main office for special projects or team building experiences. But most of the time, coworking spaces involve shaing space in an environment where people work for other companies (or on their own businesses) within the same facility. Just sharing the surrounding facilities and amenities such as kitchens, copier rooms and a reception area with people other than their team can provide influences and ideas that they would not get in a corporate environment. The team spaces of business centres are often rented on a short-term basis for projects or for teams looking for a permanent home of their own. But some teams have found the environment so productive, they have stayed in this type of office space situation for more than two years at Telsec. Even those who are a one-person operation and looking for a place to work that is not in their home (and may have considered working from a coworking office space or shared office or hotdesk), have seriously considered the price of each. 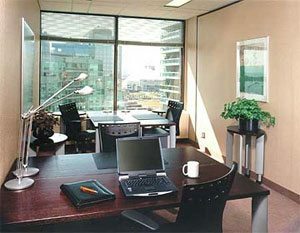 One coworking office space in Toronto offers a monthly access of $395 for a non-dedicated desk and no place to store files or a computer when they are not there. When potential coworking businesses learn that they can have a semi-private office that they only share with one other person for the same price, they question the value of coworking office space. This is especially true when they realize that with the semi-private office they get 24-hour access 7 days a week, and can lock the door to their office and leave files and their computer there, knowing they are safe and secure. There is also the added benefit of main-floor security personnel and special elevator access. Choosing what is the best office for your small business also comes down to having a business address. A coworking office does not provide you with a professional business address or a receptionist who answers your calls as directed. An office in a business centre does. One last thing to consider when thinking of utilizing a coworking office environment is whether or not you are looking to get help and collaboration from a potential competitor – or whether you are looking to provide help and collaboration to others at the expense of your small business. Collaboration and coworking might be fine in the first few days, weeks or even months of your start-up. But having a professional address and office space are also key to your business success.